So i’m back with my second instalment to this years Christmas gift guides and i’m really enjoying putting these together again this year! 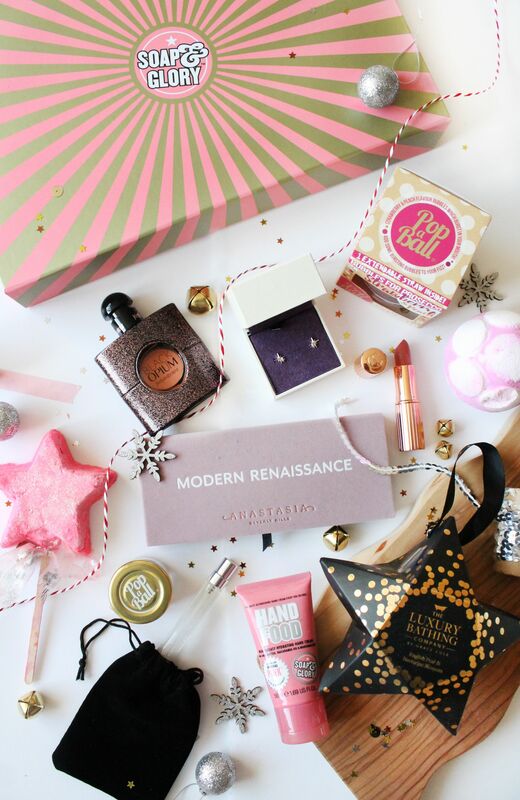 If you missed my first gift guide you can read that here for all things fragrance gift related, but today i’m bringing you my favourite kind of gift guide… a gift guide for her! Stuck on what to gift the gals in your life? This gift guide has got you covered! When it comes to purchasing for us gals I know how tricky it can be to get it right, but on the flip side we’re so easy to shop for and you probably don’t even realise it! Starting off with the most obvious things.. makeup. You honestly cannot go wrong with makeup of some description and one of the most obvious is an eyeshadow palette. One of my favourites is the ABH Modern Renaissance Palette (£43) and is a palette that is loved by many, and is so easy to use to create a number of different eye looks! Another makeup gift that any lady would be happy to receive is a lipstick and you cannot go wrong with a Charlotte Tilbury Lipstick (£24). The packaging it absolutely stunning and they have a variety of different shades and finishes to suit any lady this Christmas. As well as makeup, jewellery is always a good gift idea as us girls really appreciate a piece of jewellery as it has some sentimental value to it. A favourite brand of mine is Muru Jewellery of who specialise in the most prettiest and amazing quality jewellery. I’ve worn their Wishbone Necklace* (£54) for years on end and to this day still love it. Another jewellery purchase that i’m always thankful for is earrings and their Little Start Stud Earrings* (£32) are just stunning but still subtle at the same time. Another gift you can’t go wrong with is fragrance because some fragrances can often be somewhat pricey and I know myself I always ask for fragrance as a gift because I know i’ll love it, and it’s a no brainer kind of present. A personal favourite of mine is YSL Black Opium (£44.95) and I know a lot of women out there love this fragrance also. Another fragrance/spray that I think would be great for someone who sometimes struggles with relaxing, anxiety or just lifes struggles is the MeruMaya Inhalations Mood Enhancing Spritz* (£14.50). This spritz was created to help improve peoples moods through the use of mood enhancing ingredients proven to uplift, ease moods and make people feel more confident and in control. It’s also perfect as it’s handbag size which means you can spray this as and when you need. Another beauty gift that would be lovely to give is a gift set with a selection of different products so they can play around and create different makeup looks. The Soap & Glory Glitz and Makeup Gift Set* (£25 was £50) is an absolute steal of a gift set as it contains 8 full size products from Soap & Glory’s makeup range and you can essentially create an entire makeup look with these products as you’ve got everything (minus foundation) that you’d need for everyday wear. Alternatively to makeup, bath and body products always go down a treat and you can’t go wrong with a few bits from Lush. A personal favourite of mine is their Snow Fairy range of which just get’s better every year with new additions each Christmas season. My favourite pick would be the Snow Fairy Jelly Bomb (£5.25) which is a fun bath bomb that turns your water into this jelly like consistency and leaves your skin feeling incredible. Another product that you cannot go wrong with is their Magic Wand Bubblebar (£6.95) which they’ve brought back for another year and i’m so glad as it’s one of my favourites. It’s perfect for someone who really enjoys having a bath full to the brim of bubbles and it smells incredible! Finally the last gift idea I thought i’d add in is just a little gimmick/fun kind of gift especially for someone who loves an alcoholic tipple from time to time. For my birthday I received loads of bits from Pop A Ball who have lots of products for pimping up your cocktails or alcoholic beverages, and even glitter gravy.. yes glitter gravy! Excitement aside they do some great gift sets including their Pimp Your Prosecco Gift Set (£22.99) which looks incredible and would make an amazing gift for anyone this Christmas. So that’s my gift guide for her and I hope it’s given you some ideas for either yourself or those you’re struggling to buy for. I’ve also linked a few more gift ideas down below if you’re still struggling for ideas, so make sure to check those out!